Always wanted to build a miniature succulent garden of your very own? Now you can do it in a teacup! Build your own miniature succulent teacup garden and learn how to care for these cute plants while also learning about their personalities and individual growth habits. Choose from a variety of mini cacti, succulents and plants suitable for keeping your miniature garden indoors. 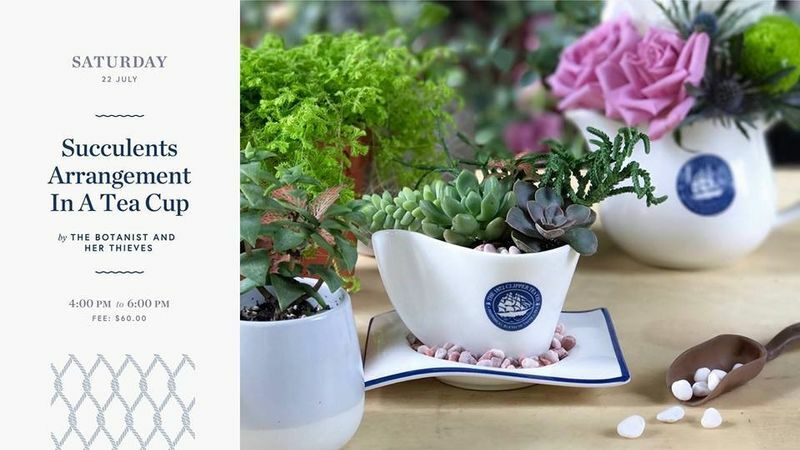 Fee includes a The 1872 Clipper Tea Co. teacup set, selection of succulents for your very own teacup arrangement and a complimentary cup of tea from the Teapitiam. Seats are limited and entry is on a registration basis. For enquiries, please contact thebotanistandherthieves@gmail.com. Join @TheBotanistandHerThieves at our workshop, or inquire about hosting a private workshop of your very own! The Botanist and Her Thieves is a plant project started by 4 girlfriends from the creative industry who bonded over garden envy and plant cuttings. They share a common love for putting thoughtfully designed products, and plants, into spaces. The girls are on a mission of curating affordable, inspiring houseplant accessories for your growing plant collection. The Botanist And Her Thieves will launch its e-shop this September. Till then, do check out their plant stories at Botanist and Thieves website.